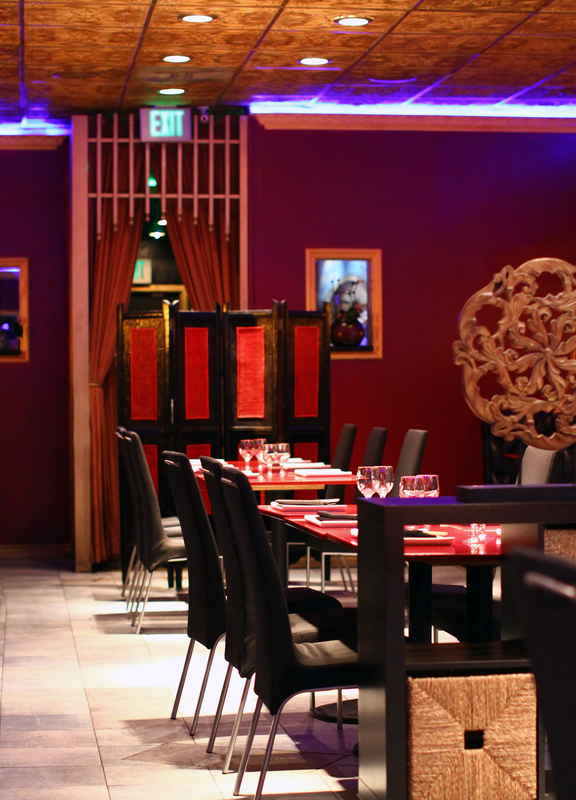 At Âu Lạc, our dishes and menu are always evolving as we find new inspiration and new ingredients. We search near and far to find our ingredients, specifically sourcing each one, so we can bring you the best in quality and flavor. We use organic produce and only natural ingredients, and we purify our water by reverse osmosis for better hydration and taste. In 1997, Mai Nguyen began operating Au Lac in Fountain Valley with a special mission in mind. Her experience in overcoming serious illness with a plant-based diet fueled her desire to promote healthy eating to her community. Driven by her passion for good food and good health, she put a plant-based twist on traditional Vietnamese cuisine. 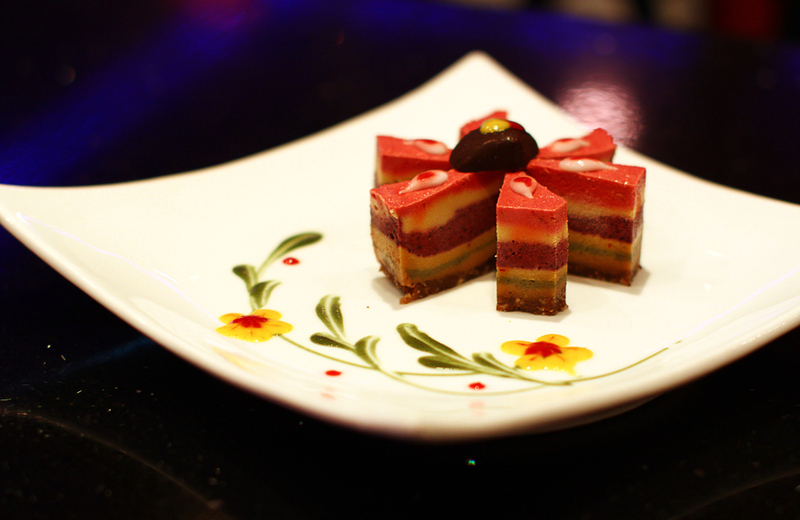 In 2001, Chef Ito joined Mai’s compassionate vision and expanded the menus with new vegan and raw creations. 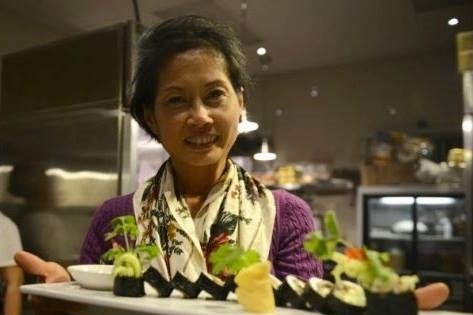 In 2015, Mai's daughter Linh Nguyen brought Au Lac's plant-based cuisine to Los Angeles, opening the family's second location. stuffed mushrooms with thai basil pesto, macadamia nuts, bell pepper, microgreens. light savory cilantro-flax broth over diced coconut and avocado. topped with flax crisps. anise and clove broth, rice noodles, soy chicken, saw-leaf herb, onion, bean sprouts, thai basil. mixed sea veggies, lacinato kale, housemade kimchi and onion tossed with spiced almonds in Au Lac's classic teriyaki dressing. topped with cucumber ribbons and a cheesy kale crisp. dehydrated green pea tortilla, cultured beans, macadamia cheese, guacamole, heirloom tomato, lettuce, onion. topped with microgreens and served with jalapeño puree. tenderized shiitake mushrooms battered with tapioca flour with a sweet and savory tamari-sesame glaze. topped with jalapeño, bell pepper and chinese chives. served over black rice and cucumber. Vietnamese-French baguette with shredded tofu and kelp noodles, pork roll, pickled daikon and carrot, vegan mayonnaise, housemade nut pate, jalapeño, cucumber, cilantro, with a side salad. tamarind broth soup with rice paddy herb, pineapple, tomato, okra, taro stem, tofu, celery, bean sprouts. served with black rice. claypot of fish, eggplant and green onion in caramel sauce with black pepper. served with black rice. fish stew of soybean and lemongrass broth with softened eggplant, fish and tofu over rice vermicelli. topped with chopped sprouts, cabbage, romaine, mint and chinese chives. nori-wrapped soy fish seasoned with lemongrass and pan-seared chili. served with black rice, cucumber, tomato, pickled daikon and carrot, jalapeño, lime and a mixed veggies soup. Mushroom, taro and carrot in a crispy eggless wrap. Served with lettuce, mint leaves and soy fish sauce. Lightly battered soy shrimp or soft tofu. Sautéed with jalapeño and cilantro. Soy pork, cucumber, chive, daikon, carrot, lettuce and mint wrapped in brown rice paper. Served with peanut sauce. Jicama, carrot, basil, soy ham, bean curd, lettuce, mint and cilantro wrapped in brown rice paper.Served with peanut sauce. Seasoned tofu and crystal noodles with cucumber, lettuce, mint and cilantro wrapped in brown rice paper. Served with soy fish sauce. Vermicelli, soy shrimp, chive, lettuce and mint wrapped in brown rice paper. Served with peanut sauce. White seaweed, wakame, daikon,carrot, tofu, onion, celery and mint tossed in soy fish sauce. Served with sesame rice crackers. Shredded cabbage, onion, mint and soy chicken tossed in soy fish sauce. Garnished with bell pepper and Vietnamese Coriander. Lemongrass-spiced broth with round rice noodles and soy protein. Served with bean sprouts, mixed herbs and cabbage. Anise broth, saw-leaf herb, rice noodles, onion and soy beef or chicken.Served with bean sprouts and Thai basil. Shiitake broth, yellow noodles, soy meats, bean curd and mushroom. Served with bean sprouts and romaine. Anise broth with fried onion bits, rice noodles, soy seafood and bean curd. Served with bean sprouts and chrysanthemum. Broth of fresh dill and garlic, with tomato, taro stem, tofu and soy ham. Tamarind broth with rice paddy herb, pineapple, tomato, taro stem, celery, soy fish, tofu and bean sprouts. Light mushroom broth with cilantro, napa cabbage and wontons with a soy ham and mushroom filling. Black rice stir-fried with pineapple, soy shrimp, soy chicken, peas and carrots. Garnished with tomato. Soy beef steak in a garlic marinade with asparagus and black rice. Pan-seared chili and garlic sauce over soy chicken or tofu. With house salad and black rice. Soy fish or tofu and eggplant simmered in peppery shiitake sauce. With black rice. Shaken soy beef with garlic over crisp watercress, onion and tomato in a light vinegar dressing. With black rice. Battered soy chicken with pineapple, bell pepper, and onion in a light sweet and sour sauce. With black rice. Pan-seared chili, peanuts, bell pepper, carrots, onion and soy beef or chicken. With black rice. Coconut yellow curry with soy chicken, sweet potato, onion, bell pepper, carrots and broccoli. With black rice or option for vermicelli. Light stir-fry of tofu, napa cabbage, bok choy, carrots, onion, snap peas, broccoli and mushroom. With black rice. Soy nori fish topped with peanuts and fried onions. Served beside romaine, mint leaves, pickled daikon and carrot, cucumber, vermicelli, brown rice paper and pineapple dipping sauce. Hot pot of faux fish stew, softened eggplant, soy fish and tofu. Served beside vermicelli and mixed sprouts, cabbage, mint and Chinese chive. Flat rice noodles in a dark shiitake sauce, with squash, bell pepper, onion, tofu and carrots. Option for sauce or without. Stir-fry of light garlic shiitake sauce with vegetables, tofu and soy shrimp over soft or crispy yellow noodles. Glass noodles stir-fried with garlic, tofu, celery, carrots and mushroom. Topped with fried onion. Yellow noodles with soy seafood, bean curd, mushroom, bean sprouts, romaine and savory sauce. With a cilantro-mushroom broth on the side. Chef Ito's play with textures and flavors, prepared within cool to warm temperatures to retain nutrients and digestive enzymes of uncooked veggies, nuts and sprouted grains. Flax seed chips topped with macadamia cheese, bruschetta and microgreens. Flax-based “garlic bread.” Served with herbed olive oil dip. Flax seed chips topped with avocado, pesto, basil, bell pepper, marinated mushroom and crisp onion. Bed of cabbage, bean sprouts, carrot, jicama and mint over a sheet of nori. Topped with bell pepper, avocado, cilantro and lime leaf sauce. Romaine and shredded cucumber tossed in sweet mustard dressing. Topped with onion, tomato, avocado, olives, flax chip and pistachio crumble. Crisp watercress, jicama and carrot tossed in teriyaki dressing. Topped with tomatoes and dehydrated onion. Spring mix greens tossed in balsamic vinaigrette with radish, mushroom and nuts. Topped by purple cabbage sauerkraut. Spring mix greens, sea veggies and kimchee tossed in creamy truffle ranch. Romaine mixed in ranch dressing and topped by marinated mushrooms, olives and dill. Light umeboshi plum dressing over romaine, shredded cucumber, mixed herbs, onion and tomatoes. Topped with pine nuts and dill. Miso-saffron broth over bean sprouts, celery, tomato, avocado, macadamia nuts and nori seaweed. Topped with dill and lime leaf sauce. Curry broth over sea veggies, coconut and bell pepper. Topped with olives and macadamia cream. Tamari-flax broth over diced coconut and avocado. Topped with cilantro and crisp flax cracker. Option to blend. Rich, green blend of spirulina, broccoli, carrot, onion and coconut oil, with floating sea veggies and bok choy. Topped with macadamia cream. Wild rice, broccoli, cauliflower, peas and corn in spiced macadamia sauce. Served over avocado, olives and cucumber. Topped by marinated mushroom, crisp onion, carrots and cilantro. Wild rice, coconut, corn and zucchini mixed with fresh basil and pesto sauce. Paired with dulse and crisp flax chips. Wild rice, cabbage, peas and tomato in a blend of saffron-spice and citrus, surrounded by avocado. Topped by marinated mushroom, bell pepper, onion and cilantro. Wild rice, zucchini and coconut in marinara sauce. Topped by avocado, marinated mushroom, carrot and rice paddy herb. Wild rice, bean sprouts, peas, corn and carrots tossed in ginger-tamari, garlic and spices. Topped by dulse, mushroom, crisp onion, cucumber, tomato and cilantro. Served with macadamia ranch. Iceberg lettuce wrap with tomato, macadamia sauce, teriyaki, flax, mushroom, bell pepper, coconut, pickles, avocado, cilantro and pistachio crumble. Spring mix, bell pepper and coconut wrapped in thin zucchini. Served with lime leaf dipping sauce. Crisp cornmeal shell, shredded cabbage, macadamia cheese, ground mushroom, salsa, dill-ranch sauce and cilantro. Served with spring mix greens in balsamic vinaigrette and topped by hemp seeds. Pine nuts, dulse, bell pepper, cucumber, avocado and coconut wrapped in nori. Served with pickled ginger and tamari sauce. Jicama, basil, mint, and macadamia cheese wrapped in nori.Served with pickled ginger and jalapeño-spiced tamari sauce. Italian squash pasta in marinara sauce, with mushroom meatballs, pine nut crumble and basil. Kelp noodles in tamari and chili, with ginger-sesame greens, mushroom and carrots. Topped with hemp seeds and Chinese chive. For female health. Nitro power, Women’s Jing, OH for women, and flower pollen extract. With cherry elixade. To focus and gain clarity. Diamond Mind tonic herbs, Bacopa for memory enhancement, DHEA for alertness, Lion’s Mane mushroom for concentration. With coconut nectar. For male health. Nitro power, Jeevani, Man Up and Ginseng. With palm sugar. To relax and let go. Cereven, L-Tryptophan, Tao tonic herbs formula and Holy Basil relieve stress and anxiety. With Pomegranate Elixade. To boost immunity. Chaga, Reishi and Maitake medicinal mushrooms provide antioxidants and liver support. With ginseng and coconut nectar. Magnesium oxide compound with Kangen alkaline water. Fujian fruit, powerful antioxidant properties, aids in digestion. Natural premium Ashitaba Leaf, from Hachijo-Island, Japan. soothing, refreshing, with coconut nectar. Caffeine-free. tonic tea of herbs and gynostemma leaves, anti-aging. Caffeine-free. fine organic green tea from Japanese spring tea leaves. Jasmine, black tea, with papaya leaf, cinnamon, anise. Coconut juice, spirulina, hemp seed, Quantum greens mix, maple. Orange juice, pineapple, mango, ginger, maple. Coconut juice, raw cacao, hemp seed, maple. 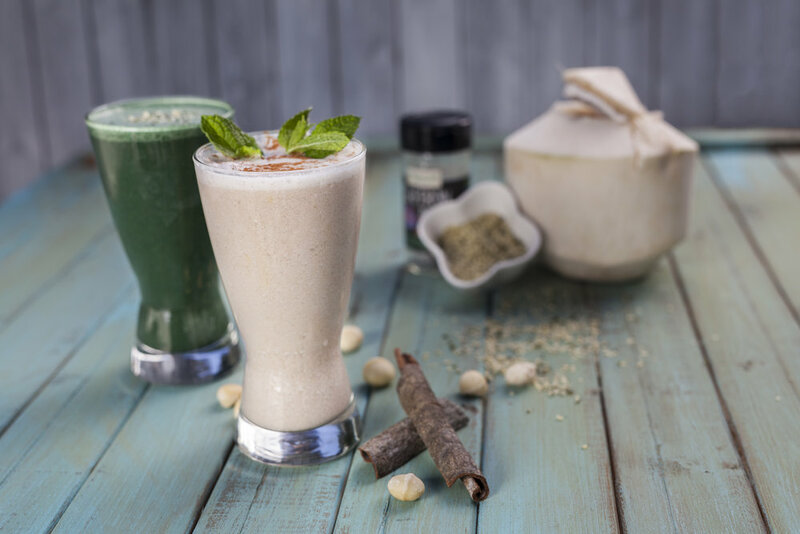 Coconut juice, hemp seed or macadamia, saffron, cinnamon. Kombucha, fresh tomato, celery, jalapeño, maple, mint. Delightful plant-based treats sweetened with raw coconut nectar and raw maple syrup. Chilled pie with layers of blueberry, raspberry, coconut and spirulina over a moist crust of pecan and dates. Chilled pie with layers of raw cacao, coconut and macadamia, over a crust of cacao, coconut flakes and pecan. Chilled pie with butterscotch-macadamia filling and a rocky walnut crust. Dotted with raspberry sauce. Rich, melt-in-your-mouth chocolates made of raw cacao and coconut oil. Warm macadamia and spirulina dough filled with liquid palm sugar. Coated in coconut powder. Inspired by the Italian dessert. Fluffed macadamia cheese, cinnamon, espresso, dark cacao, and maple syrup. For FV reservations, please call us at 714-418-0658. For LA reservations, reserve via OpenTable.